Y’all! We can’t believe it! Lindsay and Dan’s beautiful southern Maryland winter wedding wraps up our 2017 wedding year!! We can not believe that 2017 has flown by so fast. We have been able to travel to some amazing places to meet our couples, fallen in love with every single bride and groom, shed many tears during first looks, speeches, first dances, vow exchanges… we are so blessed to be apart of y’alls lives!! It’s only fitting that Lindsay and Dan wrap up our year. 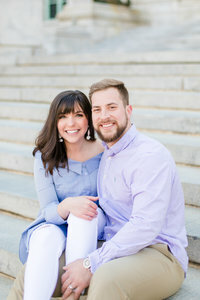 From their engagement session in Gettysburg, we hit it off right away! We even got to go skiing with them! They have become great friends of ours, and watching them share their first look (which DAN was so happy that we did! Yes, grooms, you’ll be thankful too! ), exchange personal vows, meet their best friends and family.. we couldn’t be more thankful to be a part of their wedding day and engagement! You’ll see in their blog post that Lindsay and her dad shared a first look, her and her bridesmaids shared a first look, Dan gifted her the most beautiful diamond necklace which matches the custom engagement ring that he had designed for her! I mean, we could go on and on about how amazing this day was. You have to see it for yourself! To view more Southern Maryland winter weddings, browse the links below!